Order your very own arched grand entrance door from ArtFactory.com today. This unique custom entryway epitomizes both style and security. We construct all of our doors with the same strength, and techniques used by royalty in ancient times to fortify their castles. This includes hand hewn mortise and tenon joinery construction. Just a few of this door's unique features include castle style hardware, and a working speakeasy porthole. The sidelight and transom windows are made with thick, energy efficient, dual pane glass panels. Furthermore, they are reinforced with solid, wrought iron grillwork for maximum security. 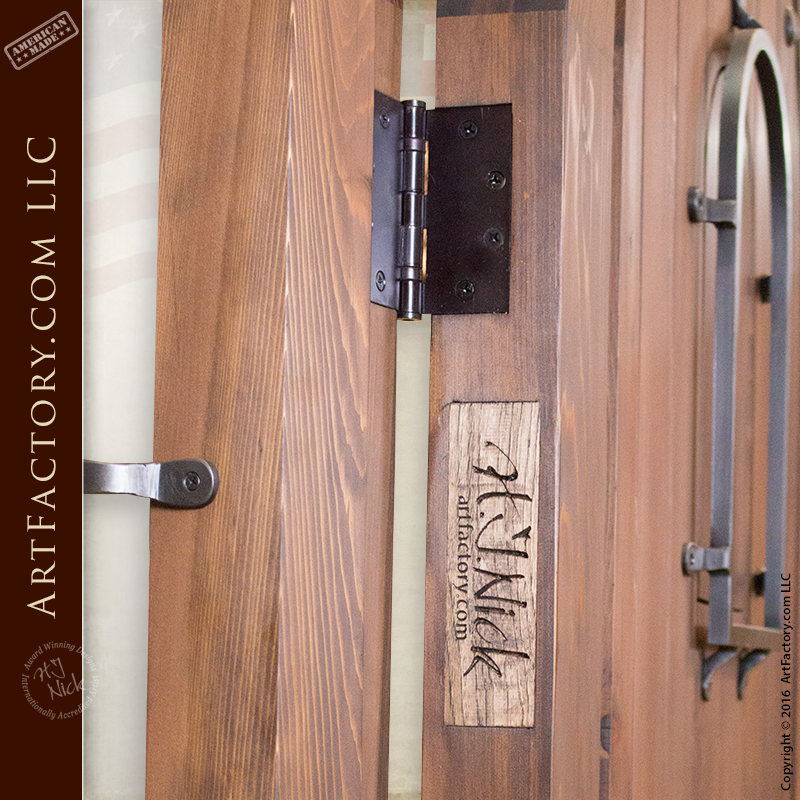 We constructed this solid wood door with thick, full length American timber, and it is hand rubbed with the stain finish color of your choice. We have over 400 designer stain colors to choose from. Our finishes are always hand rubbed, using a multi-step process that blends the finish into the grain of the wood. This makes for a fine art quality finish that won't fade, flake, or crack like painted on finishes. 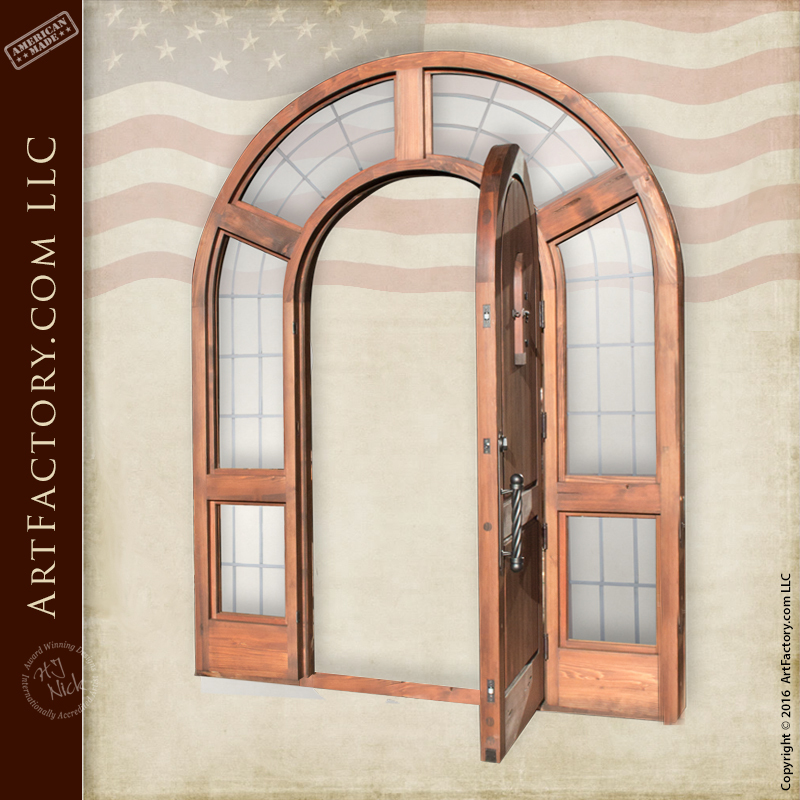 Sidelight and transom windows surround the arched grand entrance door to allow in the perfect amount of natural light. All of our sidelight and transom windows are built using thick, energy efficient, dual pane glass. You can choose from dozens of glass styles that we offer including decorative and etched glass. Furthermore, the glass panels are all reinforced with hand forged iron security grillwork. When you put it all together, you have a custom entrance that is a true display of both fine art style, and fortress strength security. 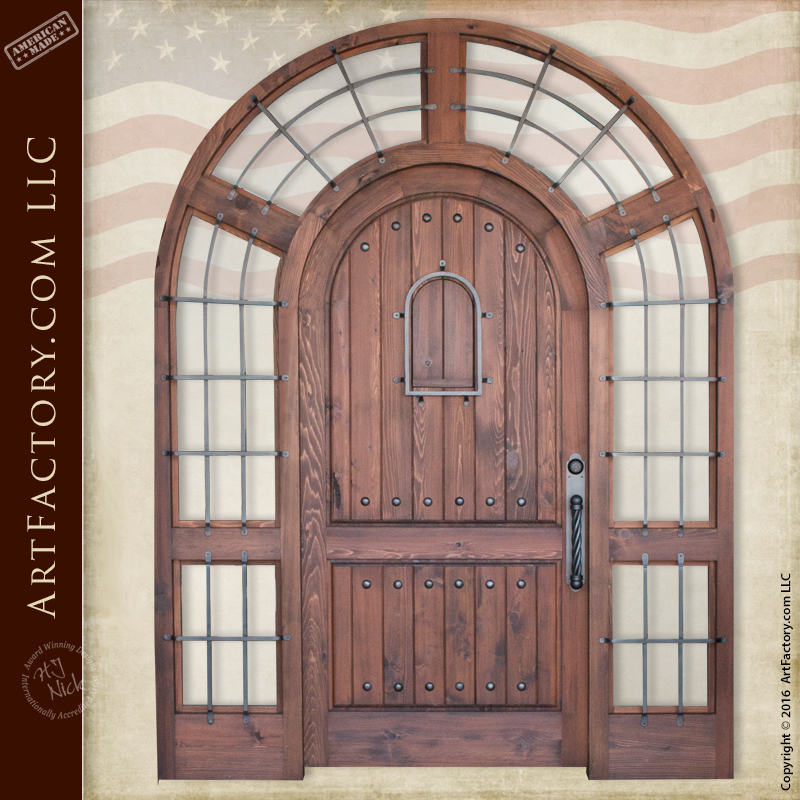 Features such as the decorative iron grills, and functioning speakeasy portal are trademarks of the style of door that our master craftsmen have been building for over a century. Furthermore, renowned artist and designer H.J. Nick personally supervises the design and construction of every product to ensure that they are built to world class fine art specifications. Each item is certified with the H.J. Nick signature, thus ensuring that is is of investment quality, with future appreciable antiquity value. 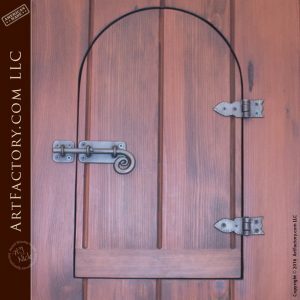 In addition to the fine art quality window grills on the transom and sidelights, this door includes our popular, ball and twist door pull. Additionally, it includes hand forged clavos, hinges, and heavy duty slide bolt style locks. All of this hardware is built by the hand of classically trained blacksmiths in our iron shop. 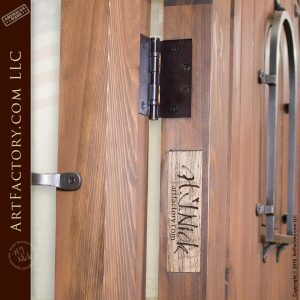 All of our hardware products are also advanced patinated with a hand applied, heat infused, iron oxide process that allows for virtually maintenance free hardware. 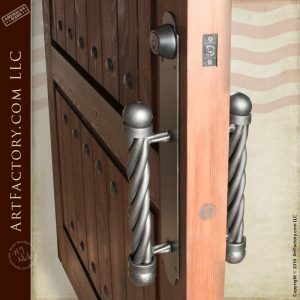 Our master blacksmiths hand forge all wrought iron door hardware products using old world techniques. Our hardware is always solid, never hollow, and built with pure wrought iron. Unlike other cheap metals, wrought iron does not corrode with exposure to the elements. Wrought iron lasts for centuries, builds a patina, and only looks better with age. As a result, your custom door hardware will stand the test of time with little or no maintenance. Every home owner needs at least one custom wooden door that he or she can truly cherish. Most noteworthy, we price our products factory direct, and create them custom made to order. Master-level craftsmen build each door by hand. Expert wood workers, and blacksmiths use their classical training to build historically correct specifications. Our products are built using methods that are tried and tested throughout history to last for generations. It is our belief that using the correct building methods and tools, is especially relevant when creating historically inspired designs. It is the attention to detail that makes the difference between low quality reproductions, and world class fine art. Furthermore, we will recreate any specific design from history at your request! When it comes to custom doors, the sky is the limit. At ArtFactory.com we are proud to build 100% of our products in the United States of America, right at our Scottsdale, Arizona factory. 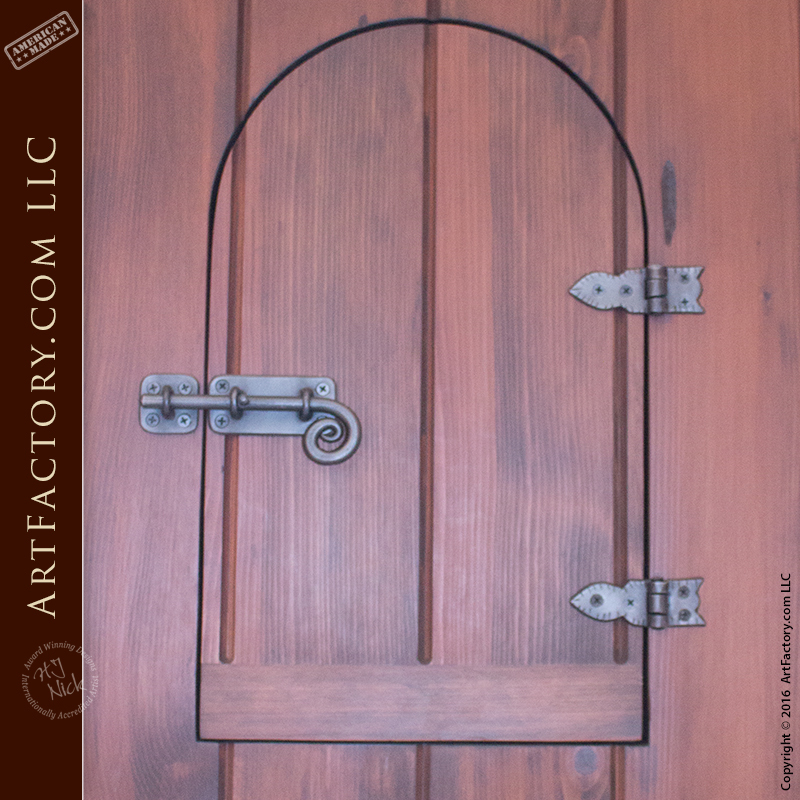 ArtFactory.com offers only the finest quality, artistic signature doors and entrances. Most importantly, our expert craftsmen, wood carvers, and metal smiths individually create each fine art door to your exact specifications. Nothing is ever mass produced, or kept in stock. In other words, we don't make it until you order it. We have no limitations on size, design, thickness or finish. Your custom door design options are truly infinite and no project is ever too large or too small for our talented design engineers. We hand make interior and exterior doors in any style, and limited only by your imagination. These are virtually maintenance free doors built to surpass all hurricane codes worldwide. Our solid wood front doors provide maximum security and are built to stand the test of time. 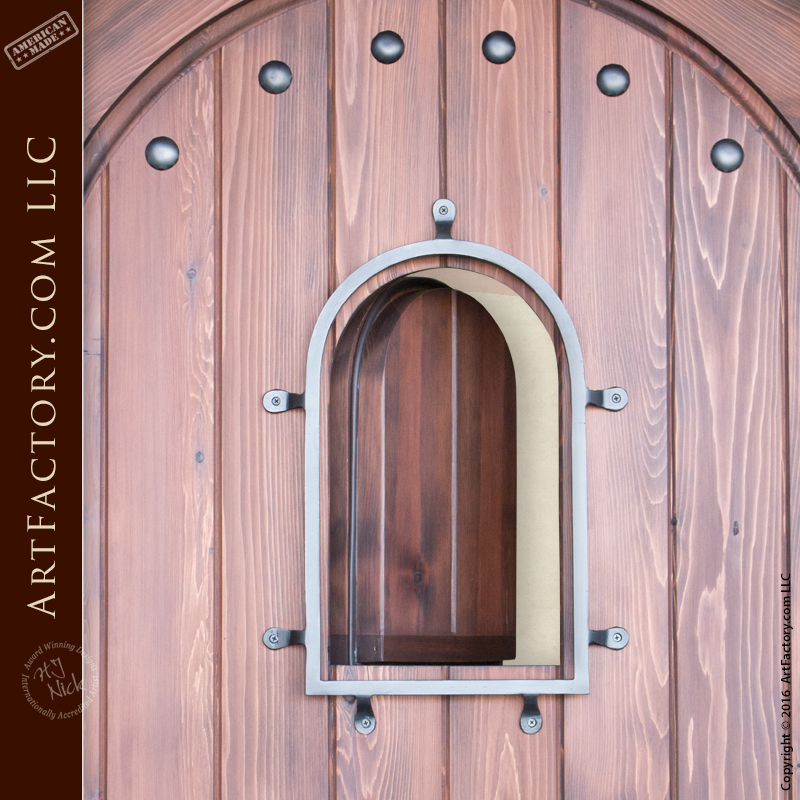 We can design any of our custom doors for either your residential, or commercial property. We can also make any of our custom door designs into custom gates or custom garage doors. Were so confident in our fine craftsmanship, and the durability of our products that, as a result we guarantee everything forever. Contact us to speak with one of our talented design engineers today at 1-800-292-0008.